Kenya's religion is much different than it was a few generations ago. Before the waves of European colonization, there were dozens of different beliefs all across the country. Each tribe had a religion all its own. As missionaries came to Kenya, religion for its people quickly started to change. Today, the majority of Kenyans consider themselves to be Christian, of varying denominations. The next most popular religion is Islam. These two religions represent about 90% of Kenya's people. With more than 4,000 registered churches, its not hard to see that Christianity is the predominant religion in Kenya. Roughly 45% of Kenyans are Protestant, and 33% belong to a Roman Catholic denomination. Specific churches range from Anglican, Methodist and Baptist to a number of off-shoot Pentecostal congregations. However, most Kenyan christians mix their official religion with varying degrees of traditional beliefs. During Kenya's British colonial period, this was a popular destination for missionaries. Though most of the country has been converted, missionary work is still active in the very remote and rural regions. 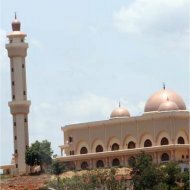 Though in a sizable minority, Islam comes in as the second largest of Kenya's religion. About 10% of the population are Muslims, with the largest communities living in coastal areas like Mombasa. It were the Arab traders and colonizers who frequented who brought Islam to the country, so it is most solidly established in these areas. The Somali people were traditionally from that area, and they are typically still Muslim today. "Traditional" religions refers to the beliefs held in the country before the arrival of European missionaries, and the spread of Christianity. Each tribe had its own set of beliefs, though not always a complete and organized "religion" as we would call it today. There were certain ideas that were common among most traditional beliefs. Many tribes believed in a single creator God, though the names would vary. God was frequently named "Ngai" or "Were", depending on the region. Any tribes that lived within sight of Mount Kenya believed that God lived at the summit. Ancestral spirits were very important to nearly all tribes, and they often sought to contact them or appease them. Even modern Christians seldom ignore these aspects of their upbringing, and still believe in these spirits. Belief in witchcraft is also common, even among Christians. Some tribes have completely embraced a modern lifestyle, and have lost much of their old beliefs. But those who still live in their age-old nomadic ways have held on to theirs. 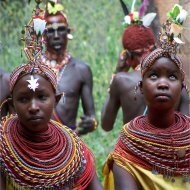 Tribes like the Samburu, Turkana and the Masai have not accepted Christianity and generally are hostile towards the missionaries. They see no reason to change. Just under 10% of the population still do not adhere to Christianity or Islam, but to their traditional beliefs. The remaining minority of people in Kenya follow religions such as Hinduism and Sikhism. Indian religions such as these came to Kenya mainly by the Indian workers who were brought in to build the Uganda rail line. When the railway was completed, many workers stayed in Kenya, creating these minority communities.